Legal technology is evolving — and it's time that your organization catches up. Embracing the many advancements in legal technology can help you save money, find opportunity, increase efficiency and add value to the c-suite. Whether these modern solutions excite you or frustrate you, it's a fact that making an investment in contract management software can boost ROI and transform the way you do business. But there's hundreds of options out there, and trying to decide which solutions are right for your organization can be an overwhelming process. What's worse, it's difficult to convince your C-suite to invest in technology when you aren't sure what's out there. Don't worry. In this guide, we'll show you the way — we'll discuss why a technology investment makes sense, help you identify which features would benefit your organization and outline some best practices for soliciting buy-in from the C-suite. 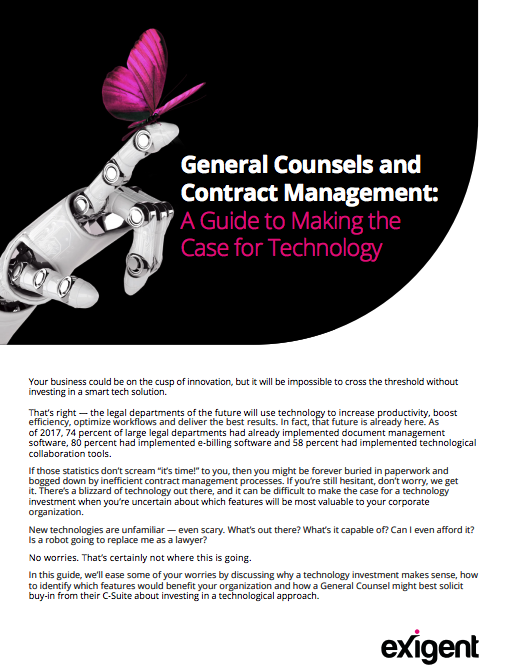 Ready to start making the case for a contract management solution? Just fill out the form and download your copy to start reading.